Dom's Walker: A Sunny Day Fund Success! Lori's Hands recently had the opportunity to support an innovative service learning experience and a LH client through one unique Sunny Day Fund project! The Assistive Medical Technologies Club at UD, or AMT, is a University of Delaware student organization dedicated to designing assistive medical technologies for members of the local community with mobility impairments. AMT modifies devices that enable movement such as toy cars, physical therapy support bars, step-and-go bicycles, tricycles, kayaks, and walkers. AMT primarily works with young children, but does not turn individuals down based on age or financial status. To learn more about AMT, check out their Facebook page. Four of AMT's student engineers spent the last six months modifying a Lori's Hands client's current walker to enable him to cook dinner at the stove for his family -- one of his favorite activities that has been made difficult by his disease. 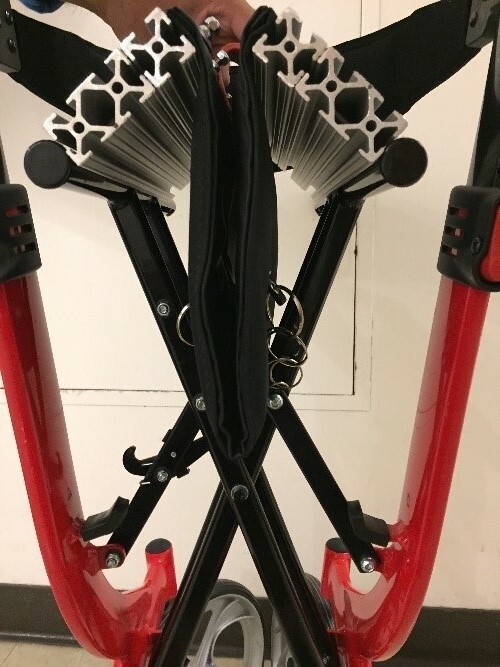 After months of planning, designing, and collaborating with Dom, AMT addressed the issue of the low seat by adding 80-20 aluminum bars under the pre-existing seat bottom to raise it up over three inches. To maintain the structural stability of the seat, an additional 80-20 bar was added orthogonally in the middle that can be removed when the walker needs to be collapsed. The bar is important because it provides a counterforce to resist the torque generated by the increase in height. Additional length was added to the strap, which one can pull up on to release the lock mechanism on the “X” shaped structure and allow the walker to collapse. In order to add 360° swivel wheels to the back of the walker, AMT removed the current wheels and braking mechanism. The students cut several inches off the walker’s aluminum frame using a bandsaw, so that the new wheels would be level and positioned directly under the back legs for better loading. They then attached the new wheels using an “L-shaped” piece of aluminum that they machined to link the red aluminum frame of the walker to the wheel plate on the castors. Dom's project represents all that makes us excited about the Sunny Day Fund! The project allowed students a real-world, hands-on chance to use their skills and education, and provided a client with support that isn't otherwise available. One of the things we love most about this project is that the students and Dom worked collaboratively on the project. Dom is a builder, designer, and fixer himself so he lent not only personal experience, but also content expertise to the project. Says student Caroline, "Working with Dom and the team on his walker the past couple of months has been a great experience. He brought so much experience to the table and really brightened up the meetings he attended." Dom is thrilled with the outcome of the project. He says the best part is the ability to "crab" or move side to side while using the walker. The original seat was too low for Dom to use when cooking at the counter or stove. The new seat raises 3-4 inches higher than the original seat. The new seat still locks into place and is collapsible for easy transport. The seat is stable when the support bar is inserted and collapsible after it is removed. The original wheels only moved back and forth, and didn't allow Dom to move from side to side. The new wheels have the capability to swivel completely, allowing Dom to move from side to side while using the walker. 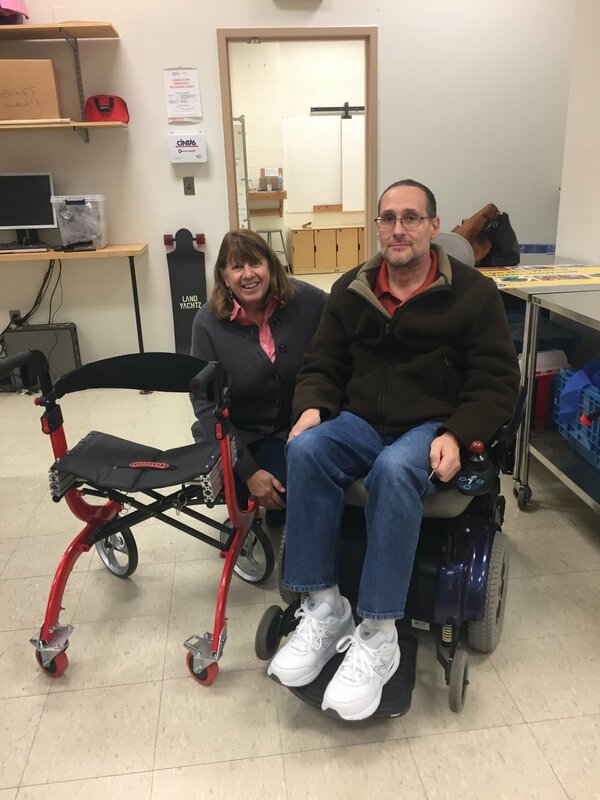 "Working side-by-side on the walker with Dom was so much fun and I loved how he has become a part of the Assistive Medical Technologies Club. I would like to personally thank Lori's Hands for making this project possible. Working on the walker from start to finish has been a phenomenal journey that I am so lucky to have been a part of." Caroline is also a senior biomedical engineer who hopes to someday work with prosthetics or other assistive technologies to enable people to perform daily tasks that otherwise would be outside of the realm of possibilities. 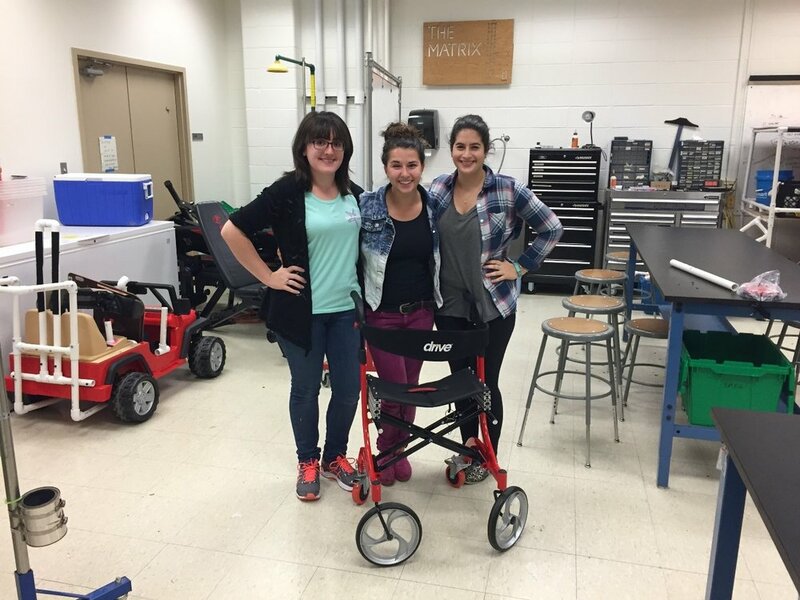 "Working on Dom’s walker has been an amazing, eye opening, and educational experience. I learned how to benchmark and brainstorm at the beginning ... I learned how to use so many different tools and machines to create our design. Handing the walker off to Dom at the end was a moment I will never forget." Alec is a junior mechanical engineer, with a passion for hands-on building. His construction experience in Tanzania has taught him to never stop considering what materials would work best for a project. He always thinks about how to make a design cheaper without cutting corners. The Lori's Hands Sunny Day Fund provides direct support to our clients. Thanks to our incredible network of student volunteers, we're able to provide lots of client support for no money at all. Every now and then, though, we find ourselves wanting to give back a little more. Examples of Sunny Day Fund projects include a day of professional yard work, a trip to a baseball game, or an upgraded assistive device like the one we funded for Dom, but could include anything that makes life a little better for the clients who teach our students so much. Students apply to the Sunny Day Fund on behalf of their clients only after researching other resources that could be used by their clients. In this case, the AMT students applied to the Sunny Day Fund for supplies and materials for Dom's walker modification. Select the "Sunny Day Fund" when making a donation to Lori's Hands to have your donation earmarked for supporting a future Sunny Day Fund project.